Being highly sought-after for its unique taste and rich aroma, our offered golden sella basmati rice is processed with the aid of innovative techniques and modern machines under the guidance of adept professionals. Our long list of patrons includes some of the biggest hotels, restaurants, and rice dealers all over the globe. Our far-reaching logistic network facilitates us to meet the demands of geographically distributed clients on a timely basis. 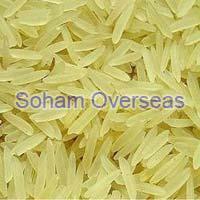 Our company, Soham Overseas is recognized as a major golden sella basmati rice exporter in India, which is engaged in offering a rich assortment at pocket-friendly rates. Our offered rice is in sync with the national and international standards, which makes us a well-accredited exporter. So, contact us on the given number or mail id to get in touch with us.